More and more workers leaving behind the old 9 to 5 routine and taking up international travel as a way of life and working. It is important that UK tech companies recognise the needs of their workers. Two years have passed since the UK decided to leave the EU and still many tech companies are worried about its potential implications. With 7 per cent of the UK’s tech workforce made up of non-UK workers* many companies are asking, how will British companies continue to make use of the growing trend of digital nomads and what are the potential barriers that Brexit may present? 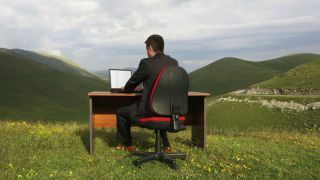 In recent years, we have witnessed an explosion in the number of people working remotely, with some estimates suggesting that the number of digital nomads could reach one billion by 2035**. Working on the tech side of a multinational company we are seeing more and more technology workers from overseas being able to work remotely and develop software from every corner of the globe. We are also seeing more people wanting to work in foreign countries or on the move as millennials are seeking a different work life balance to their parents. There is a growing tech community outside of the UK with some of the world’s best developers and programmers coming from countries like Belarus and Estonia. To facilitate this growth, Estonia is looking at the possibility of a ‘digital nomad visa’ designed specifically for those who work online, in an attempt to attract new talent to their country. With the uncertainty of Brexit, it worries many in tech hiring positions that these foreign based workers will be unable to continue working from abroad and therefore unable or unwilling to work for UK companies. With Hostmaker being at the intersection of the travel and technology industries we have always encouraged our teams to travel and explore. We firmly believe that this is something every business should encourage, as creating smaller barriers for travellers is good for any economy. As with any scaling business, we are recruiting at a pace and looking for the best workers in every field, which in our case, is technology. As the demand for our services increases, we need to be able to have a technological framework that can keep up. The uncertainty around foreign workers due to Brexit makes it hard to know if we are making the right hires, developing the right technology and the right strategy. Having expanded across Europe in recent years and this year to Bangkok in Thailand, we have been using technology specifically designed for remote working and investing in this will continue to help us and other companies address the issue of recruiting the best people. Being a company that, from day one, was always aiming to have international offices, we have built our tech around the idea of remote working. By ensuring remote working is part of your company culture, it allows you to get the best possible talent from all over the world and allows us to offer our engineers, developers and product managers a better work life balance. When we began, we were looking for senior engineers and above for our team. To be open to a wider talent pool through remote working, we invested time in looking for candidates who had worked in remote-setup before or demonstrated self-motivated attitude. We did this through a number of ways, but one was to have our coding test have an additional, bonus test and most of the candidates who did the bonus test went through to the second stage. While referrals have been the best source of candidates, advertising on remote working job aggregators like remoteok or weworkremotely helped us to start getting traction among those people we were looking for. 1. Invest time and money in specially designed technology. With the development of tools like Slack, Hangouts, Github and Jira it has never been easier to have people working, productively, across borders and time zones. When I started at Hostmaker, I was based in Cambridge and only travelled to the office once a week. All communication was done remotely. These conversations ranged from minor everyday tasks to key decision making. By developing CI/CD practices, focus on code quality and streamlining processes we were able to offer a very effective way of working remotely. 3. Consider remote working from day 1. While building our own applications was always the final goal we had to use 3rd party tools initially whilst we set up. We made sure that these tools were conducive to being able to work remotely and leveraged them to best fit our needs. One example of our developed apps is our workforce management tool. This application enables our operations coordinator to allocate services to housekeepers/drivers. This then notifies the jobs to our staff on the ground via our operations mobile-app. 4. Make sure you keep the team feeling connected. By definition, the digital nomad travels and generally alone so, essentially, they work for themselves. However, at Hostmaker, we believe it is important that they feel like they are part of a community. We have tech consultants spread all over Europe which means that regular weekly catch ups are impossible. But we also recognise the importance of creating a friendly and flexible workplace. To do this we introduced regular meetings, so the sense of team wasn’t lost. To do this, our team meet every three months, and each time in a different city. During these meetings, the team have day-long catch ups, where they can update, plan, brainstorm new ideas and socialise. We are seeing more and more workers leaving behind the old 9 to 5 routine and taking up international travel as a way of life and working. It is important that UK tech companies recognise the needs of their workers and adapt their working structure accordingly. Being able to leverage workers from abroad is a huge opportunity for UK business to increase the talent pool for hiring and many businesses are hoping that it will not be hampered by Brexit.